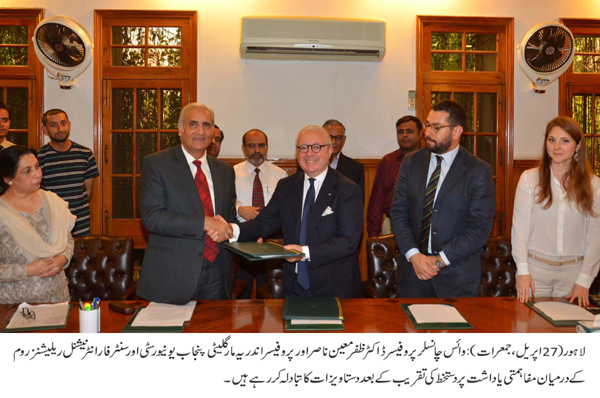 LAHORE: (Thursday, February 27, 2017): Punjab University and Centre for International Relations, Rome have signed a memorandum of understanding to promote bilateral relations, exchange faculty members and launch joint research projects. In this regard, an MoU signing ceremony was held at committee room of vice chancellor’s office here on Thursday. 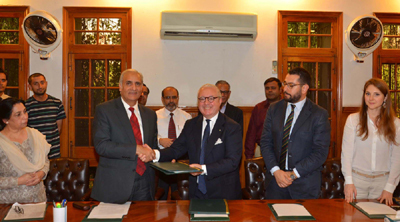 PU VC Prof Dr Zaffar Mueen Nasir, Registrar Dr Muhammad Khalid Khan, Director Pakistan Study Centre Prof Dr Massarrat Abid, Centre for International Relations Rome Chairman Prof Andrea Margelletti, coordinator and analyst Dr Gabriele Iacovino, Asia Desk Analyst Ms Francesca Manenti and faculty members were present on the occasion. Addressing the ceremony, Dr Zaffar Mueen Nasir said that the MoU would remove misconceptions about Islam and Pakistan. Prof Andrea Margelletti said that Islam was a peaceful religion and had nothing to do with terrorism. He said that through this MoU, we could help governments to understand each other in a better way.